The growth of Latino communities has been a central story -- in many communities, the central story -- in the South's recent history. Starting in the 1980s, accelerating in the 1990s and taking flight over the last decade, the rise of the Latino South has changed the face of the region and permanently shifted its political landscape. But at the moment, the largest immigration wave in U.S. history may be losing steam. This week, the Pew Hispanic Center released a study which shows that the net flow of migrants from Mexico to the U.S. has completely stopped -- and may even be negative, with more people leaving the U.S. for Mexico than coming to this country. It wasn't a complete surprise: As Facing South reported in January, another study by the Princeton Mexican Migration Project had come to the same conclusion. But it once again raises the issue of the disconnect between the growing battles over immigration policy at the state and federal level, and the reality of declining immigration itself. The Pew report finds that the number of immigrants from Mexico to the U.S. fell by more than 50% between 2005 and 2010. In the same time period, the number moving from the U.S. to Mexico doubled, from 700,000 to 1.4 million. 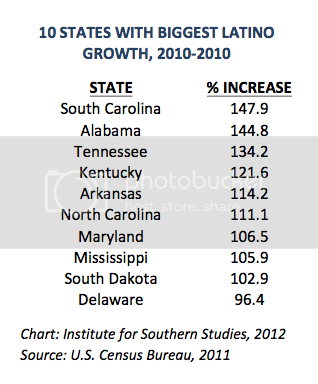 As the 2010 Census showed, Southern states had been the biggest beneficiaries of Latino immigration over the last decade. Indeed, the growth of these Latino communities were the single biggest factor in the South gaining eight Congressional seats and Electoral College votes after the 2010 Census. Mexican immigrants make up 63 percent of the nation's entire Latino population, according to the Census. What's caused the reversal? The fact that the slow-down started before Arizona and subsequent states enacted get-tough immigration legislation makes that an unlikely explanation, although they have had undoubted impact. What does it mean long term? What will happen when the economy picks back up, and now that the Obama administration -- after harsh criticism from Latinos -- has apparently eased on deportations? Stay tuned.